Happy Saturday everyone!!! 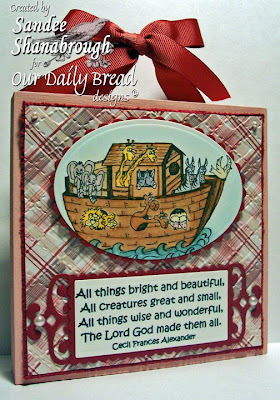 Here is a project I made using this month's Our Daily Bread designs release called Noah's Ark. This is the sweetest baby stamp set ever!!!! I had a blast creating this! I was inspired by the colors of this bag from Espe for the Inspiration challenge today. These little pails are adorable and easy to work with. Just put a little gift card inside and done!!!! Don't forget our Blog Hop at the ODBd Blog on Monday the first! There will lots of fun and prizes!!! The new stamp sets being released are incredible!!!! It's called Noah's Ark and is part of January's release. Aren't the little animals just adorable? the image is embossed with clear embossing powder. but if not, go check out the blogs of some of my DT sisters!!! The rest of the ladies have some peeks for you too so go check them out! we are having our Blog Hop on Feb. 1st!!! Hey y'all!!! Hope everyone is having a great week!!! Our Daily Bread designs called He Watches Me. I just love this sparrow image! 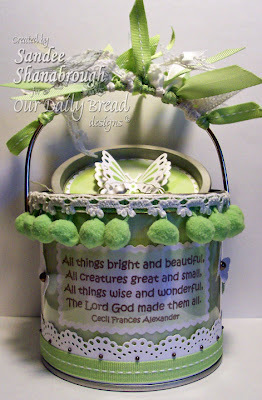 I used this week's Midnight Madness sketch and the challenge at Stampin' Sister in Christ to use just a touch of green. I colored the image with copics and sponged a considerable amount of ink all around! 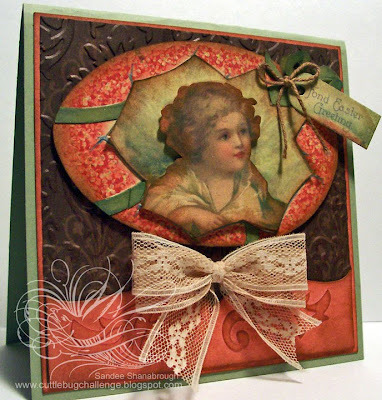 The Cuttlebug Damask folder and die combo is so fun to work with! The little flourish thingies make great corners! And I enjoyed going through my button collection to find just the right ones to use! Don't forget about the hop coming up on the first! These new sets are so wonderful and I know you will love them too! Good morning everyone!!! 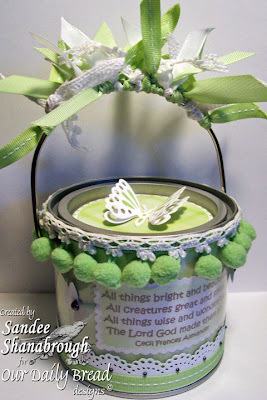 Today is Be Inspired Wednesday over at the Cuttlebug Challenge Blogspot! 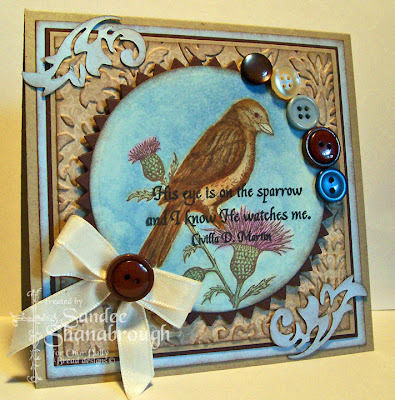 This week we are sponsored by Crafty Secrets and we were challenged to make vintage projects and/or cards. 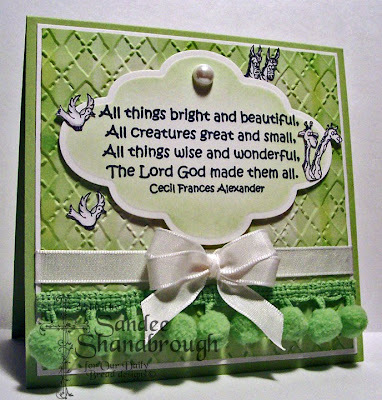 I was able to download this gorgeous image from the Crafty Secrets website for free!!!! I printed it three times so that I could cut it out and layer for dimension. 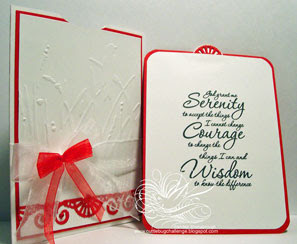 I used this gorgeous Cuttlebug Damask embossing folder and die combo seen here on the Provocraft website. The bottom curved border is a piece from one of the die cut parts and I glued the little swirly die cuts onto the border for added interest. I 'painted' some Glimmer Mist on the printed ribbon around the egg and surrounding the angel. I sponged everywhere, including the seam binding bow, for that vintage look. Go check out the Cuttlebug Challenge Blogspot for more inspiration!!! The Design Team has a lot to show you today!!! Our Daily Bread designs Sneak Peek!!! Yeah!!! Oh my goodness!!! The new Our Daily Bread designs sets being released on Feb 1st are gonna blow you away!!!! Kelley has done it again I tell ya!!! This sneak peek I have for you tonight is using a set called Nest!!! I used two of this week's challenges. 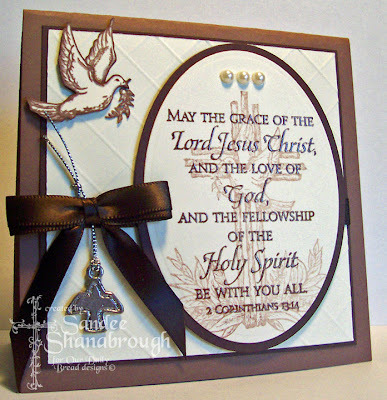 The Stampin' Sisters in Christ was to make a card that could be given for a house warming based on the scripture Joshua 24:15 As for me and my house, we will serve the Lord. Today's Ways to Use It challenge was to 'Cut it Out', having cut outs on your card. My base card is Creamy Caramel which I matched with Bordering Blue and Sage Shadow to match the designer paper that I have no idea where it comes from!!! The cover has disappeared!! I stamped the nest with Memento Ink and colored it with copics. I sponged the base, designer paper, and the Spellbinders circle and label with Tim Holtz distress ink. The nest and tree limbs are cut out and layered. The ribbon is SU! I made a bow with my Bow Easy, and added Flower Soft to the nest and the Hero Arts flower. Get ready for some fabulous cards being sneaked by the other ODBd designers!!!! These new sets are fantastic and we are all so excited! Hope you have a great weekend and thanks for visiting with me!!! scroll down to the next post or just click here! Hi everyone! I have two cards to show you today! The first one is for this week's Color Challenge on SCS. Betty's challenge was to use Bashful Blue, Soft Suede, and Ruby Red. I've used the new set from Our Daily Bread designs called Confirmation. I embossed the background with the Ornamental Iron Cuttlebug folder and sponged the edges with Bashful blue ink. The scripture is stamped with Memento Brown. This is cut out with a Spellbinders Octagon and sponged while inside the die. I layered this with a Scallop Octagon die cut and the Renaissance Hearts Pendant die cut. I cut out the dove and outlined and shaded him with copic markers #E74 and B00. The suede strip at the bottom is punched with an EKSuccess punch. I added Zva pearls and ribbon and a bow I made with my Bow Easy. Seriously love my Bow Easy!!! This one I did for this week's Midnight Madness Sketch! I used SEI designer paper and matched it with Bravo Burgundy, More Mustard and Ruby Red. Isn't that designer paper just gorgeous?! The scripture from the Baptism/Confirmation Verses set cut out with a Spellbinders Labels Four die and I sponged the edges with burgundy and ruby red ink. I also used Spellbinders Doodle Parts die cuts. To finish the card I added Zva pearls, another Bow Easy bow, gold cord, and some flowers cut from the same SEI paper! is having a Blog Hop!!!! It'll be a lot of fun so see ya there!!! 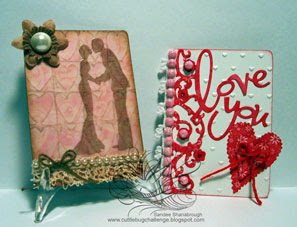 This week we are creating ATC's for Valentine's Day! I love making ATC's. The smaller size can be challenging but is really fun too! The base for both of my ATC's is a regular standard size (2 1/2 x 3 1/2) playing card! This ATC is all Cuttlebug, no stamping! The papers are SU! Whisper White and Real Red patterned paper. I sponged with Rose Red ink. 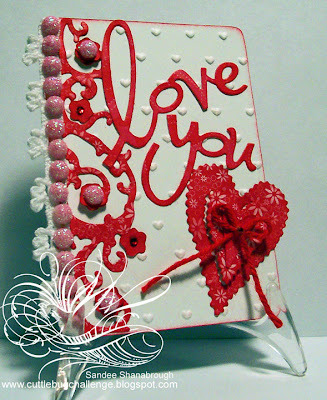 The background and the sentiment are done with the Love Language Combo embossing folder and dies. I also used Floral & Scroll Border Dies and Hearts and Stamps Bundle Dies. I added extra flowers, layering a few of them. I finished with lace, pink sparkly thingies, red twine and red rhinestones. Now, for this card, I embossed a piece of pink designer paper with the Heart Blocks embossing folder and dirtied it up with Creamy Caramel and Chocolate Chip inks. Then, I stamped the Inkadinkado image with Memento Brown ink onto vellum and used clear embossing powder. I attached this right over the pink and made sure is was stuck down real good. (I used my Xyron for the adhesive) I dirtied it up some more, added the lace, pearls, brown twine and SU! flowers and large pearl. I hope I have inspired you to make your own little ATC's! Hi everybody! Hope all is well with you!!! I made another card tonight with the adorable new set from Our Daily Bread designs called Noah's Ark! I found this designer paper and the sweet pom pom trim at Joann's the other day and have been stewing over this card in my head for days now!! I cuttlebugged it with the Argyle embossing folder and sponged around the edges with Certainly Celery ink. I cut and embossed a piece of Whisper White with a Labels Six Spellbinders die and sponged with Celery ink while it was still in the die. I used my Stamp-a-ma-jig to place the sentiment. I stamped the little animals and cut them out. They are outlined with a C1 copic marker. The ribbon and pearl are StampinUp!. And I made the bow with my Bow Easy tool! I'm off to bed earlier than usual! I'm so sleepy! Thanks for stopping by! Have a great week y'all! It's time for the Cuttlebug Challenge Blogspot's Be Inspired Wednesday #66! We are still focusing on the new Asian folders that are being released by Provocraft! I don't have mine yet so am using the same folder that I used on my card last week! 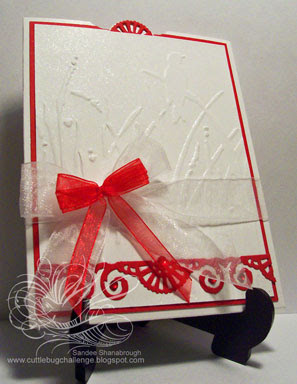 This week's challenge is to make a pocket card with the Asian theme and to use red! I made my pocket with Whisper White and Real Red cardstock. I embossed with the Bird Call folder and sprayed it with Marshmallow Glimmer Mist. For the bottom border I used the Ornamental Iron Combo die, and added some pretty red rhinestones. I used a circle punch to cut the little partial circle at the top. For the tag, I rounded the corners and made a little handle using the same Cuttlebug die. The Serenity Prayer is from Our Daily Bread designs. Hi again! I made another card! I wanted to showcase this gorgeous SEI paper that Kelley sells in her store! It's just so pretty! I matched it with Sahara Sand for my base card. The layer behind the paper is the other side! On the left side I used an EK Success border punch. I stamped the sentiment from the new Our Daily Bread designs set called Baptism/Confirmation Verses and cut it out with an oval Spellbinders die. This is layered with a Spellbinders Labels Four die cut. I did a little sponging with Sahara Sand ink. I added SU! ribbon and made the little bow with my Bow Easy. Then I added the pretty Prima daisies and Zva pearls to finish the card! And that's it!!! Thanks for looking!!! Have a great night! I had some time to play in a couple of challenges today so made this card. It's for today's SCS Color Challenge and this week's Midnight Madness Sketch. I flipped the sketch, hope that's ok! The base card is Pretty in Pink with a layer of Rich Razzleberry and Chocolate Chip designer paper that is embossed with the Houndstooth folder and sponged with Chocolate Chip to hightlight the embossing. 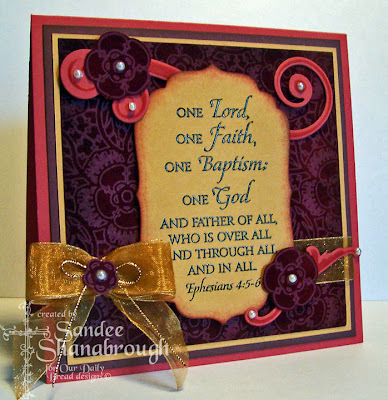 The image is one of this month's releases by Our Daily Bread designs called Confirmation. I stamped it onto Vanilla after stamping the ink off once. The sentiment is stamped over that with Chocolate Chip too. I cut this out with a circle Spellbinders die and sponged with Pretty in Pink while still in the die. This is layered with Pretty in Pink, Chocolate Chip and a Rich Razzleberry Spellbinders Lattice die cut. I used the Spellbinders Lattice border layered with Rich Razzleberry at the bottom. The Razzleberry layer is trimmed to match the border. I used three of the little cut outs from the die cut to trim the top of the pendant and the edges of the border. I then added the bow that I made with my Bow Easy. To finish the card I added lots of Zva pearls!!! So glad you could visit today! Check out the ODBd forums at SCS. There is another little contest going on!!! More fun things are planned too!!!! Good morning!!! 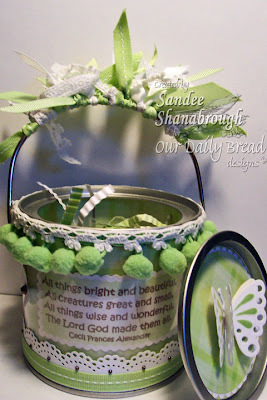 Today is the first Our Daily Bread designs challenge as a SCS Member Company! WooHoo!!! I want to show you a card I made with one of the new sets called Confirmation! 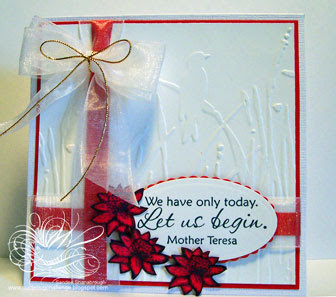 The challenge is to make a card with browns and to use a punch or die cut. The base card is Close to Cocoa and is 4 3/4 x 4 3/4. I've layered the oval and background with Chocolate Chip. I stamped the cross image (stamping off once) onto Vanilla with Close to Cocoa ink, then I stamped the scripture over that, using a combination of Versamark, Memento Brown and clear embossing powder, and my heat tool. My handy Stamp-a-ma-jig helped with the placement of the scripture. I cut this out with Spellbinders oval dies. I stamped the dove twice, cut them out (one of them I cut out the back wing and the branch), outlined them with a copic marker (E74), and then used the paper tole technique, to give it a little dimension. Next, for the background I created a lattice with my Scor-pal! What a great tool this is!!! I used my Bow Easy to make the bow and attached a charm from my stash with silver cord. I added the Zva pearls to finish the card! We want you to play in our challenge! When you upload your creation to SCS or other online galleries, use keyword ODBDC110 which stands for Our Daily Bread Designs Challenge January 2010. All entries for the challenge should be entered in Mr. Linky on the blog. You have until January 23rd at 8 p.m. to link to Mr. Linky. Entrants do not have to use Our Daily Bread Designs stamps to enter but if they have them we really would love to see them. stamps at the Our Daily Bread Designs store. Also, don't forget we are celebrating our new Member company status, and we’re giving away a BIG prize!!! If you visit the ODBD Welcome Forum and leave a comment by January 10, you will be entered in a drawing to win a $50.00 Gift Certificate to the ODBD Store! So you have until tomorrow to participate!! Thanks for looking and joining us in our challenge today! Hi everyone! Got in some more playing time! I am loving this newly released Noah's Ark set by Our Daily Bread designs!!! This time I made a masculine baby card! I have been stuck on girl colors lately! haha!! 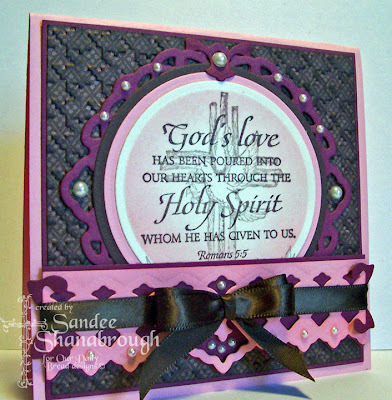 This is also for the Stampin' Sisters In Christ challenge this week. the old has gone, the new has come!" or a new Christian’s conversion. So to start, I embossed a piece of StampinUp! designer paper with the Cuttlebug Argyle folder and sponged the edges. This is layered with Creamy Caramel and a piece of blue cardstock, I found to match at Archiver's. I stamped the image with Memento Brown and colored it in with copic markers. The sky is sponged with Soft Sky. 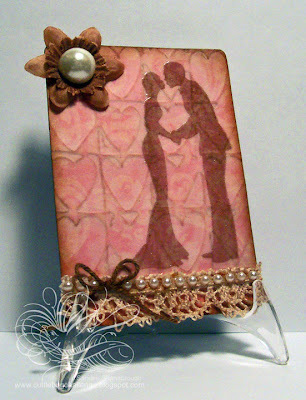 I used the Spellbinders Labels 4 die to cut out the image and sponged the edges with brown. I attached this with foam tape. The bottom border was punched with an EKSuccess border punch. I used my Stamp-a-ma-jig to place the sentiment. The blue bow was done with my Bow Easy and then I added Martha Stewart brown thread too. Thanks for visiting with me tonight! Hope you all are having a nice evening! I've been playing tonight! Yay! This card is for this week's Midnight Madness sketch and the TLC on Monday. The technique was to make a quilt on your card! I added a little twist though! I started by punching squares from a pretty piece of SEI designer paper and sponging them with Tim Holtz Antique Linen Distress Ink. I ran each square through my little Xyron and attached them to a piece of cheap cardstock. I trimmed it up, sponged the edges and then for a little twist I Cuttlebugged this with the Argyle folder for a more quilted look! This is layered with Soft Suede, another piece of the same SEI paper, Soft Suede and Sahara Sand for the base. 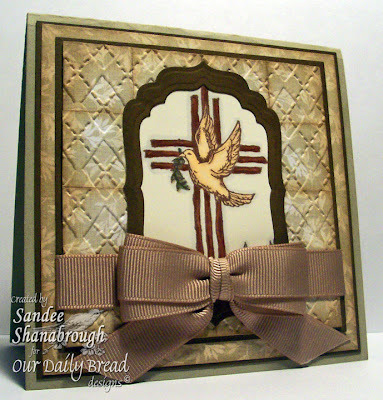 I stamped the cross from the new Confirmation set released this month from Our Daily Bread designs with Memento Brown and colored it with copic markers. I cut this out with the Spellbinders Labels Four die. I then cut out a frame, actually from one of the Soft Suede layers that you can't see! I added a pretty bow I made with my Bow Easy and decided that I needed to stop! You all know how hard that is for me to do! haha! Thanks for stopping by tonight! is having on Saturday to celebrate our SCS Member Company status!!! It's sure to be a lot of fun so see you there!!!! My First Cuttlebug Challenge Design Team Card! 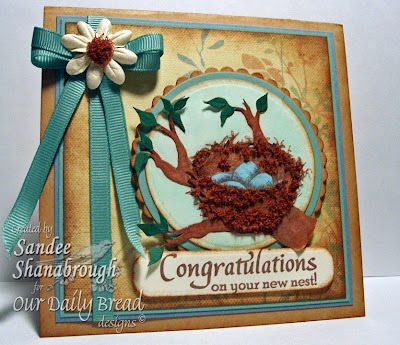 I am showing you my first card as part of the Design Team at the Cuttlebug Challenge Blogspot and today is Be Inspired Wednesday #65! The team was asked to make a card with an Asian theme with white as the main color. My base card is a textured pre-made American Crafts card that I cut down to 4 3/4 x 4 3/4. I embossed the Whisper White layer with the Cuttlebug Bird Call embossing folder and sprayed it with Marshmallow Glimmer Mist and added it to a layer of Real Red. 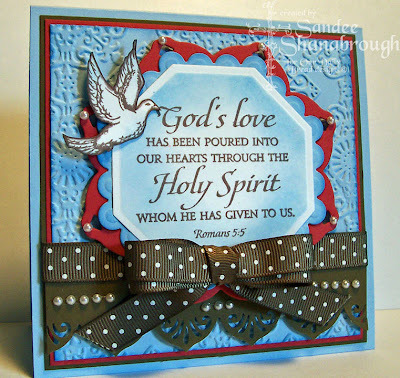 The stamp set I am using is from Our Daily Bread designs called Let Us Begin. The flowers are colored with various red copic markers, cut out and I used the paper tole technique. I masked just a portion of the sentiment, cut it out with a Spellbinders oval and layered with a Spellbinders scallop oval die cut in red. I added red ribbon, white organdy, a pretty organdy bow I made with my Bow Easy. I finished the card with some gold cord on the bow! Go check out the Cuttlebug Challenge Blogspot!!!! So much talent on this team and I am honored to be a part of it!!!! Hope you all are doing great this first week of 2010!!! I wanted to show you a little gift I made that matches the card I made for release day this month for Our Daily Bread designs. I used the adorable Noah's Ark set. This is an artist's canvas (5x5) that I painted with a pale pink. I matched this beautiful SEI paper, which is embossed with the Argyle cuttlebug folder, with Baroque Burgundy. I distressed the Burgundy layer with my distressing tool. I colored the image with various copic markers and cut it out with an oval Spellbinders die. This is layered with a scallop oval die cut. I cut the sentiment and the mat with rectangle Spellbinders dies which is then highlighted with more Spellbinders die cuts. I added Zva pearls and then pretty matching ribbon is stapled to the back of the canvas and tied in a bow to hang it with! Can you believe it's 2010?!!! Wow! I hope all of you have the best year ever!!! Well, here we are again, the first of a new month and new releases from Our Daily Bread designs! You are gonna love these sets! We are celebrating with a blog hop which will last until the 4th at 8pm EST, so you'll have plenty of time to play! If you arrived here from Connie's blog you are going the right way! If not, go to the ODBd blog, and begin. Visit each designer's blogs, leave a comment and finish up back at the ODBd blog and leave a comment that you have done this, and let us know which set is your favorite and why. That's all you need to do! Kelley has generously offered to give away not one, not two, but THREE PRIZES! So Three winners will be chosen, and they can each choose one set of their choice!!! How cool is that!!! as a Member Company on Splitcoaststampers! Please visit the ODBD Welcome Forum and leave a comment by January 10! If you do, you will be entered into a drawing to win a $50.00 Gift Certificate to the ODBD Store! We have a many things planned including Challenges and a special Prayer Request area! We will be having a weekly challenge which will be posted on the SCS Forum as well as the ODBD Blog. That means more prizes and awards, and fun for all!!! Today I am using the set called Noah's Ark. How sweet this set is! My color inspiration came from this gorgeous SEI paper which I matched with Baroque Burgundy (SU! retired) and a pale pink I found at Archivers. Then I had fun coloring the ark image with tons of copic markers. I used Spellbinders dies to cut out the ovals. I did the pink strip at the bottom with Martha's lace border punch and added ribbon from my stash. I used my Bow-Easy to make the bow!!! And that's it! From here, please go visit the blog of the fabulous Kathy! She has a wonderful creation ready for you to see! Don't forget, you have until the 4th, to visit and comment on all the blogs and then to comment on the ODBd blog letting us know which new set is your favorite and why!